The results of the services you offer are visible so it makes since to use this to your advantage whenever you possibly can. One of the best ways to do this is taking quality photos of your work. This can before and after or just after, the important part is that the images represent the level of work you offer day in and day out. There are a few ways you can go about getting pictures of your work. You can hire a professional or you can do it yourself (DIY). One will cost you some dough, the other will cost you some time. It all starts with actually making an effort to take pictures. Some people are picture taking, if you’re like me you’re not one of those people. 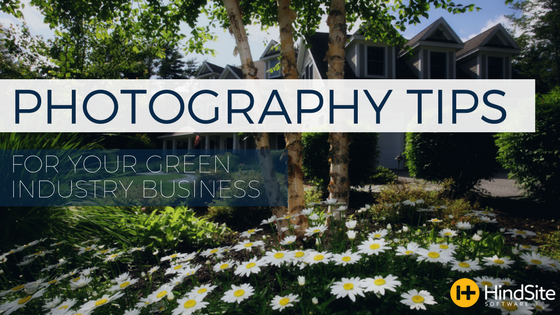 But when it comes to taking photos of the beautiful work you do for someone’s lawn or landscape, it can pay off in the long run. From being the final factor to sway a potential customer or marketing material that grabs people attention, a picture is the one of the best way to show what your business is capable of. Having a DSLR camera always helps but nowadays it’s not always necessary. The cameras on the newest Androids and iPhones (iPhone8 & iPhoneX) have the capability of taking professional looking photos. If your too busy to spend timing lining up the perfect picture and you have the money, hiring a professional photography is the option you should go with. And it will cost you but you get what you pay for. Most pros will run you $800 to $2,500 per day. If you end up deciding to take the pictures yourself, doing so whenever you feel like it, won’t get you the results you want. Instead take some time to plan it out. Think about everything you’ll need or want. What properties do you want to capture? Do you want to involve a crew? Do you want before and after shots? Then, depending on what you decided, coordinate accordingly. This tip is pretty self-explanatory, before you start taking pictures of someone’s property you should talk it over with them and get their permission. The best time to take a photo is either in the morning after the sun rises or in the late afternoon before dusk. Overcast days also provide the right lighting. What you’re trying to avoid are shadows and extreme bright spots that will distort and hide areas in the photo. Similar to picking the right time, you’ll want to take pictures when the lawn and landscape is looking best. You - more than anyone - understands when this is. It’s when the trees are full, the plants are blooming and the grass is greenest. Before you start snapping a way, set up the scene. Remove all the eyesores and extra stuff that will distract from you’re trying to capture: your work. From hoses to leaves to debris to equipment make sure the shot doesn’t capture anything that shouldn’t be there. Tripod: Using a tripod will give you better depth of field and will help composition. Go low: Most of the time a lower view will end up looking better. Variety: Don’t just settle for a few pics of the same shot. Take a variety of vertical, horizontal, wide and detailed shots. Ugly: If you’re taking before and after pictures make sure the lawn or landscape in the before pic looks as bad as it possibly can. Consistency: It’s important - in some way or another - to mark the spot where you took the before shot and that the angle is the same in both photos.